We are looking for volunteers who can help with Wakamatsuri. If you are interested, download the application form, fill it in, and send it to us by fax or mail by the end of April. This is a festival organized by voluntary executive committee members. We apologize in advance. There may be some delay in responding. Wakamatsuri a festival with a long tradition that has been supported and sustained through many difficulties on the back of the efforts of many people since its start in 1622. However, it costs a lot of funding to preserve traditional culture. 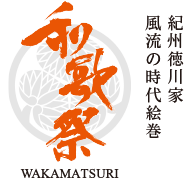 We seek donations from people who agree with the idea that the success of Wakamatsuri will help with further development of Wakayama, and it should be passed down to future generations.